Welcome to Down On The Street, where we admire old vehicles parked on the streets of the Island That Rust Forgot: Alameda, California. What, more than two years of DOTS and no custom vans yet? Hmmm... that was actually kind of horrible. I was too young to drive back then, but I'm pretty sure Sammy Johns wouldn't have been my choice for custom-van soundtracks. See, that's what happened with Generation X and our damn cynicism and irony- we couldn't appreciate the simple pleasures of purple shag carpeting and CB radio. 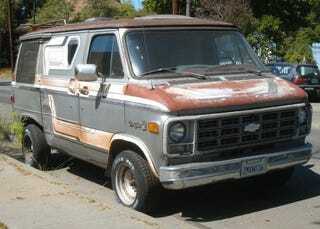 Anyway, it's good to see this battered but still recognizable Custom Van Era survivor still moving around under its own power.